Tinctures are concentrated liquid herbal extracts, made by steeping fresh or dried herbs and other plant parts in alcohol. Traditionally, vodka or brandy is used to make a tincture. Alcohol is used in order to break down the cell wall of the plant, allowing the plants bio-active compounds to be released and stored into the alcohol. After the herbs steep for 4 weeks, the liquid is strained and administered under the tongue, usually about 20-30 drops or a few droppers full each day. Tinctures are one of the many ways to administer herbs internally. Teas, syrups, and herbal pills are some other effective ways to ingest herbs. However, tinctures are highly absorbable, concentrated, compact, and will last a lifetime if kept away from direct sunlight. These features of herbal tinctures make them an easy, effective way to make herbs a part of your life, no matter where you are. Tinctures date back as far as distilled alcohol. Ancient Egyptians soaked herbs in alcohol to create tinctures and cordials- tinctures made with lower alcohol content. In 1025, The Al-Qanoon fi al Tibb (The Canon of Medicine) was published, explaining many medical topics including herbal tinctures. It was the basis for the teaching of medicine in the West from the 12th-17th centuries, making these discoveries of the medicinal uses of distilled alcohol ingrained in Western medicine. Distilling wasn’t commonly known in Europe until the 1400s, and became widespread around 1500, though the Irish and Scottish peoples adopted distillery much earlier than the rest of Europe. By the “Victorian” era in Anglocentric cultures, tinctures were common. Laudanum is a tincture used over the counter in the U.S. until the 1970s, commonly with small children. Warberg’s tincture was a common medicine used in the treatment of fevers, including malarial fevers and was used to treat colds until the 1980s. Until the 1920s, cannabis Indica tinctures were sold in your average pharmacy. Any number of the elixirs and other medicines found commonly advertised were either cordials or tinctures. It wasn’t until pharmacology moved on to emphasizing pills that the usage of tinctures greatly declined. Now, tinctures are once again gaining popularity, as more people are becoming educated about herbal medicine and the traditional ways of preparing it. You will see a wide variety of tinctures and herbal extracts at local food co-ops and large health food stores. Tinctures are a great option for those who lead a busy lifestyle, and don’t have time to prepare herbal teas daily. They are also convenient for travel, and for carrying in a handbag so you can administer your herbs wherever you are. Tinctures are concentrated, so dosages are small and can be diluted in water to hide taste. They require no preparation once made, and as long as kept out of direct sunlight tinctures will never expire. If you ask your elders, many times they will remember the days when their own grandparents were using herbal remedies in their daily lives. Chamomile- for calming the nerves, promoting restful sleep, headache remedy, and more! Lemon Balm- for boosting the immune system, relieving anxiety and tension, promoting restful sleep, and nourishing the nervous system. Red Raspberry Leaf- for anemia prevention, cold and flu remedy, menstrual cramps, and to support pregnancy and postpartum. Nettle- a highly nutritive herb, great for all ages, high in vitamins and minerals, helps to strengthen the skin, hair, and nails. Chaga Mushroom- high in antioxidants, B vitamins, shrink tumors and kill cancer cells, boosts the immune system, helps reduce stress, anxiety, and depression. Step 1 Decide which herbs you will use for your herbal tincture. You may use one herb or a mixture of a few, depending on what medicinal properties you would like your tincture to have. If you have health conditions, make sure the herbs you are choosing are safe for you to use. If your herbs are fresh, chop them into small pieces. Step 2 Pour your herbs into your mason jar. You may tincture as much herbs as you like, but a good place to start is to fill your jar 1/3 of the way full with your herbs of choice. Step 3 Pour your alcohol over your herbs, covering the herbs completely with the alcohol, then keep pouring until the alcohol is above the herbs 2 inches. Step 4 Cover your jar with an airtight lid. Shake your tincture, and label it with the herbs used, type of alcohol used, and date made. Step 5 Place your jar in a warm place away from direct sunlight. 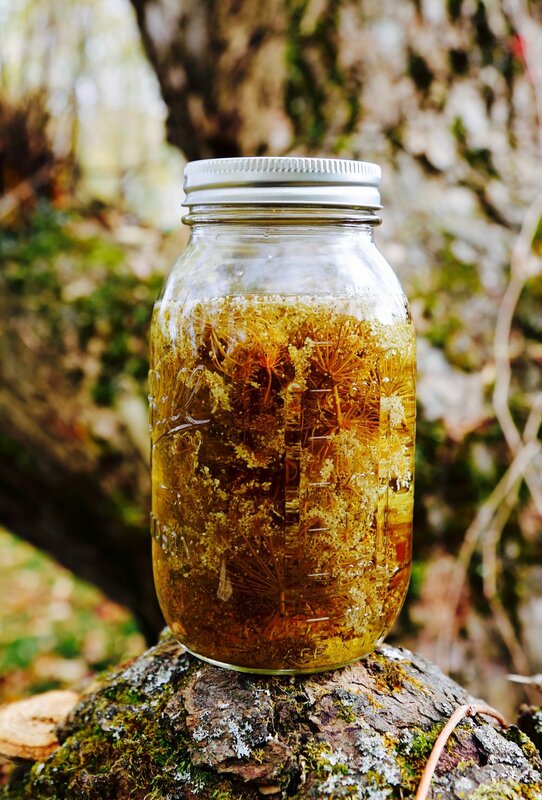 You will let your tincture steep for 4-6 weeks, shaking it daily to help open the cell wall and release the medicinal properties form the herbs. Step 6 After 4-6 weeks, strain your herbs from the alcohol. You can transfer your tincture to glass dropper bottles if you have them. Be sure they are labeled properly with all ingredients! Since your tincture is made with alcohol, it will last indefinitely if stored in an airtight, glass container and away from sunlight. 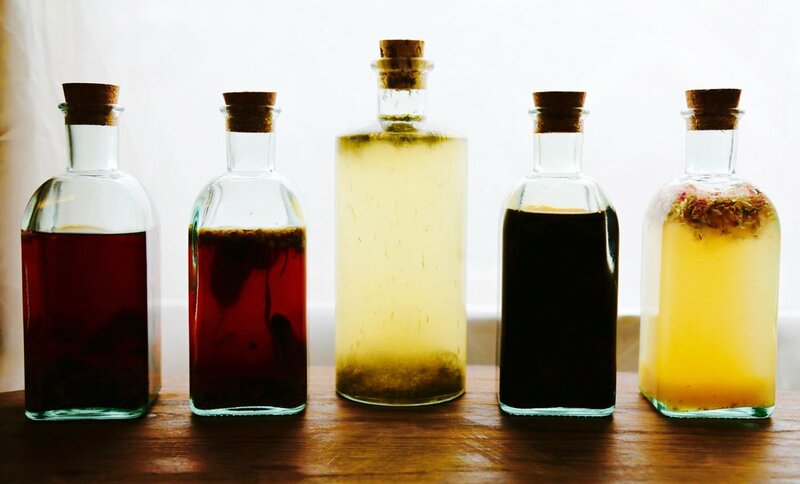 It's best to store tinctures in dark amber or blue glass to keep out any direct light. Dosage depends on what kind of herbs you have used, but a good general dosage to start with is 1/4 teaspoon 2-3 times daily- you can work your way up from there. If the taste is too strong, you may dilute the dosage into one cup of water or tea. Pay attention to your body and any differences you feel. If you’re not getting the results you need or want, then you may need to up your dosage or change your formula. Record your recipes and dosages as well as any affects they may be having on you, so you can begin to create formulas that are unique to you and your family's needs.